NEW YORK, Jan. 26, 2017 /PRNewswire/ -- Today SiriusXM announced that the multi-talented Craig Ferguson will launch a daily program exclusively on SiriusXM. Broadcast live from Los Angeles, "The Craig Ferguson Show" will debut on Comedy Greats channel 94 starting Monday, February 27. Known for his quick wit and frequently offbeat humor, Ferguson charmed millions of viewers during his decade-long run as the host of "The Late Late Show with Craig Ferguson" on CBS. The Scottish-born comedian rose to late night prominence for his wonderfully bizarre freeform monologues and informative interviews with everyone from movie stars to the Archbishop Desmond Tutu. Ferguson will showcase his unique talents on his new two-hour SiriusXM show, which will feature his perspective on the news of the day and have celebrity interviews, sketches, and correspondent stories. SiriusXM subscribers will also be able to call into the show and talk directly with the comedian. 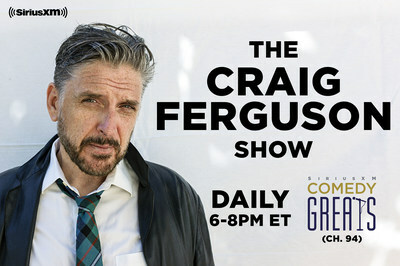 "The Craig Ferguson Show" will air weekdays from 6:00 pm – 8:00 pm ET. "This is premium quality drive-time entertainment. It's like Game of Thrones in your car without pictures. Also, given recent events on earth, I wanted to return to a daily show without the restriction of wearing pants or shaving [anywhere]," said Ferguson. "I look forward to working in an environment that has zero censorship and zero network interference. The melon-farmers at SiriusXM told me to say that." "Craig Ferguson is a great broadcasting talent with a singular style, and we are thrilled that he is bringing his wit and talents to SiriusXM," said Scott Greenstein, President and Chief Content Officer, SiriusXM. "Throughout his impressive, award-winning career, Craig's irreverent charm has won over millions of Americans, while proving himself a true original. Now with his daily show on SiriusXM, Craig will deliver a completely original comedy show to our national audience, a commitment from a triple-threat talent that we are very excited to launch." With an eclectic career that spanned the worlds of film, television, and stage, in 2004 Ferguson took on late night comedy as the host of CBS's "The Late Late Show with Craig Ferguson." His successful 10-year run landed him a Primetime Emmy nomination and a 2009 Peabody Award for Excellence in Broadcasting. In addition to its critical acclaim the show also set an all-time viewer record. A true renaissance man, for seven years Ferguson co-starred on "The Drew Carey Show," wrote and directed feature films, has received three Grammy nominations, published two New York Times bestselling books, played drums in British punk bands, and has performed standup comedy before sold-out audiences at Carnegie Hall, Radio City Music Hall, and all over the U.S. and Canada. He also won two Daytime Emmy Awards for Outstanding Game Show Host for the nationally syndicated "Celebrity Name Game." In addition to Comedy Greats channel 94, SiriusXM subscribers can hear "The Craig Ferguson Show" via SiriusXM On Demand, through the SiriusXM app on smartphones and other connected devices, as well as online at www.siriusxm.com/player. Sirius XM Holdings Inc. (NASDAQ: SIRI) is the world's largest radio company measured by revenue and has more than 31.3 million subscribers. SiriusXM creates and offers commercial-free music; premier sports talk and live events; comedy; news; exclusive talk and entertainment, and a wide-range of Latin music, sports and talk programming. SiriusXM is available in vehicles from every major car company and on smartphones and other connected devices as well as online at siriusxm.com. SiriusXM radios and accessories are available from retailers nationwide and online at SiriusXM. SiriusXM also provides premium traffic, weather, data and information services for subscribers through SiriusXM Traffic™, SiriusXM Travel Link, NavTraffic®, NavWeather™. SiriusXM delivers weather, data and information services to aircraft and boats through SiriusXM Aviation, SiriusXM Marine™, Sirius Marine Weather, XMWX Aviation™, XMWX Weather, and XMWX Marine™. In addition, SiriusXM Music for Business provides commercial-free music to a variety of businesses. SiriusXM holds a minority interest in SiriusXM Canada which has approximately 2.8 million subscribers. SiriusXM is also a leading provider of connected vehicles services, giving customers access to a suite of safety, security, and convenience services including automatic crash notification, stolen vehicle recovery assistance, enhanced roadside assistance and turn-by-turn navigation.